Andrea was classically trained at the University of Glasgow in composition, and has also gained a Masters in composing for TV and Film. Andrea has scored feature films, including The Devil’s Rock. She has had short films played in Cannes Film Festival Shorts corner and Night of the Hell Hamsters went on to win awards all over the world, including nominations for Best Score. Andrea’s music has appeared in TV shows including Keeping up with the Kardashians, Come Dine with Me, and Tales of Northumberland with Robson Green. 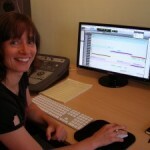 In 2011 Andrea was one of eight composers chosen for the inaugural Composers Lab at the Edinburgh Film Festival.